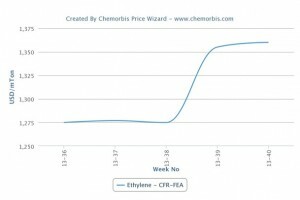 Spot ethylene prices managed to hold steady this week in the spite of the weaker energy complex as per the pricing service of ChemOrbis. Crude oil futures recorded steady drops since the last week of September before paring some of the losses in the middle of this week. Players in Asia attributed the stable trend of ethylene mainly to the reduced feedstock output in the region stemming from several cracker shutdowns in Japan, Taiwan, Malaysia and Singapore during the autumn season. The downstream PE market, too, was on a stable path on a lack of supply for certain products. On the NYMEX, crude oil futures for November deliveries represented a gain of around $1.5/barrel week over week owing to a rebound on Wednesday following relentless drops since late last week. The spot ethylene market in Asia defied falling crude oil prices and consequently lower naphtha costs that declined $20/ton on the week, by remaining firm on a CFR Northeast Asia basis. 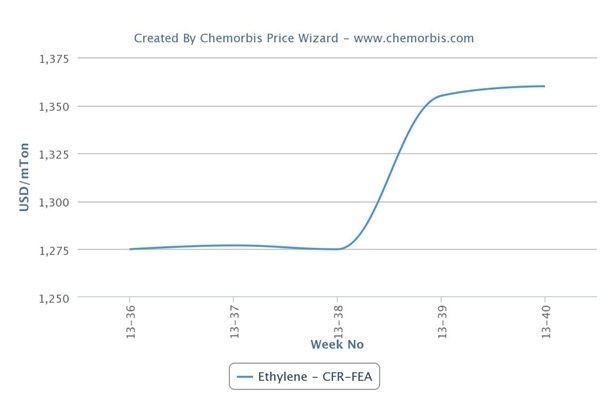 Moreover, the latest spot ethylene figures still stood $85/ton above the month-ago level. Players in Southeast Asia report that steady ethylene costs helped support stable levels in the PE market this week as sellers were unwilling to step back from their prices blaming high costs on the back of feedstock tightness. Plus, availability for certain PE products, particularly LDPE, have yet to ease amidst output issues or shutdowns at several polymer producers’ plants. An overseas Middle Eastern producer announced their October shipment prices with increases on the back of limited supply and firm upstream costs. “Buyers are just buying on a need basis due to uncertainty about the market outlook,” a producer source lamented. “However, prices will remain firm in the coming days as there are many crackers under maintenance which keeps ethylene prices high,” he added. A seller in Singapore was informed that a Middle Eastern producer will not have LLDPE to offer before December on supply issues. “Demand will improve in the last quarter amidst tight supply and firm ethylene costs. Prices are likely to remain on a stable to firm trend for the near term,” he noted. A trader in Vietnam commented that prices are on a stable to firm trend supported by the firm upstream costs due to cracker turnarounds. Buyers, on the other hand, are purchasing the bare minimum and electing to monitor the post-holiday scene in China rather than stocking up given their discouraging end product business. “Prices are high despite the very slow demand situation. Sellers keep claiming that supply is limited. They will try to keep the market firm as currently ethylene remains firm although the crude price is soft,” commented a bag manufacturer. A bag and film producer reported that a regional producer will close down their lines for certain grades as they are not profitable. “Sellers are not willing to give PE discounts on limited availability. We believe that current prices will not be sustainable as demand in Southeast Asia is still sluggish and the local currencies remain weak,” the buyer noted. According to ChemOrbis, most players in the region plan to follow a “wait and see” stance until Chinese players return from their National Day Holiday early next week as they believe that the future direction will depend the post-holiday atmosphere in that country.